Tracklist of the 2018 CD "Carry The Torch / Electric Thunder"
Produced by NEW YORK and Eric Carr. Tape restoration for the 2018 CD release by Michael Scott Mills. Track 14 - 15 : ‘Don’t Fall” & ‘Electric Thunder’ taken from a promotional CD compilation. Recorded at Millbrook Sound Studios in Millbrock, NY. 2018 Executive producers J. Golden & G. Shafer. Re-mastering by Jamie King at The Basement Studios NC in Winston Salem, NC. ca. 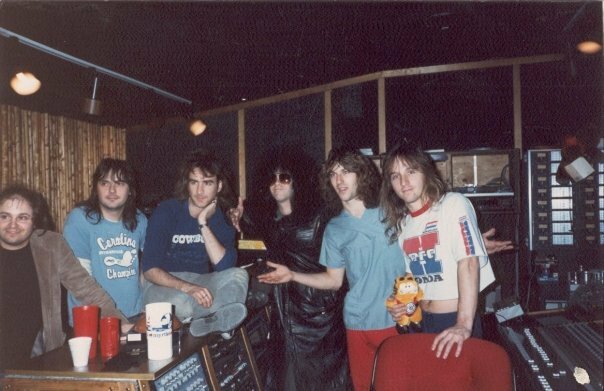 1986 -1987 ; Eric Carr - New York (the band) recording session. After KISS "Animalize" tour in 1985 Eric Carr started branching out into different projects, like looking for other bands to manage and produce. "New York" was one of the bands he had any involvement with. 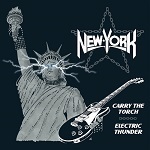 "New York", featuring 'J' (vocals) Johny 'G' Lover (guitars), Freddie Foster (bass) and Rikk Hanz (drums), released one independent EP "Carry The Torch" in 1984 (Tinker\Grand Slamm Records). After the release of the "Carry The Torch" EP, drummer Rikk Hanz was replaced for Michael Constable. Michael Constable quit the band prior to going into Millbrook Studios with Eric Carr. After setting the band up (with new drummer Scott Mills) in a friends studio in upstate New York (for a quick pre-production), Eric Carr went up there for a day and a half to give the band some advice. At the same time he wrote a song together with the band called "Electric Thunder". from left to right : Paul Orofino (Engineer), Freddie Foster, Jimmy Ennis, Eric Carr (KISS), Scott Mills and Johnny Glover. Thanks to Curt King of Demolish Mag for additional info and permission to use the photo above.